Raise your hand if you have ever taken a photo that lacked interest? Yes, it may have been pretty. Yes, it may have been technically sound. But did it hold your attention? Did it tell a story? I have found that the photos that stand out most to me are about so much more than a perfect smile; they are about who the subject is right in that moment. If it is a child, I’m more excited to capture who they are at this stage: their curiosity, their shyness, their ability to ham it up for the camera. The “perfect smile” does not intrest me. In my years of taking photos my style has really evolved. I have moved away from standard poses, props, and stiff photographs. I have really tried to focus on the in-between moments. The moments that a mother will cherish. If I can make a mom cry, I consider that #winning haha. No for reals, I feel there is no greater compliment than capturing an image that is so beautiful and so real that it brings someone to tears. I tell many clients that although these photos are for you as the parent, they are just as much for your children, as they are the legacy that’s going to be left behind. I always think about that scene from the movie “Beaches”, where Hilary is digging through an old box of photos trying to remember what her mothers hands looked like. One day, photos will be all that’s left, and I want to ensure that each client has photos that tell their story. Make sure your clients know your photography style BEFORE they book a session. This may seem like a no-brainer, but you would be surprised how many photographers advertise one type of photography, then get disappointed when people show up and just look at the camera dumbfounded. You will notice that neither my social media nor my website show any photos of people looking at the camera; I only post photos that display connection and emotion. Don’t get me wrong, I definitely take some posed “christmas card” photos during my sessions, because we all know grandma will want a copy, however I only post what I want to attract. I don’t want to attract clients who come expecting to sit and smile. My ideal client is going to be wanting emotional photos, and therefor will come to their session prepared to open up. Educate your client on what to expect and help them prepare their families accordingly. Once you book a session, it is so important to educate your clients on what to expect during their session. 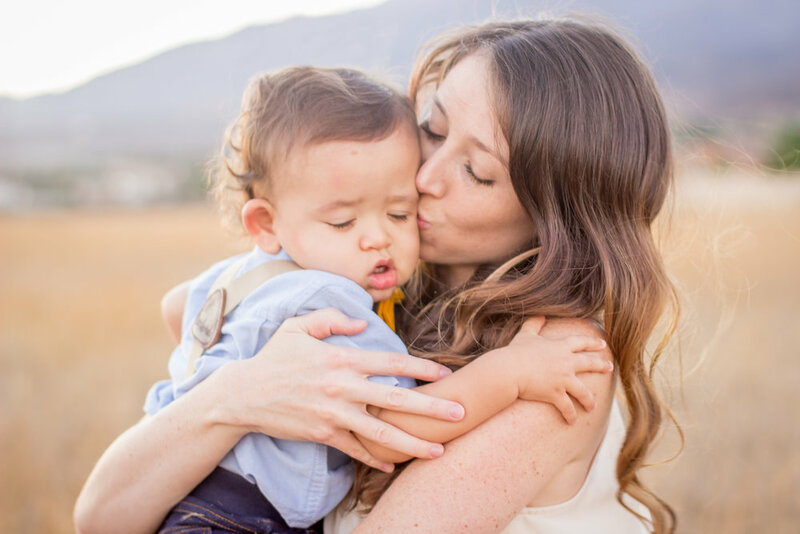 As mentioned, many people are not comfortable being that vulnerable in front of the camera, and even though they WANT intimate photos with their family, they don’t know how to get them. I give every client a welcome guide that gives a detailed breakdown of how each session will unfold. I give them tips on how to prep their husbands and children so everyone feels at ease and are not shocked when I ask them to get close. I also provide them with styling tips and am constantly reassuring them that there is nothing to fear. I think many people default to a pose-and-smile type photo session because they honestly just don’t know how to do anything else. As a photographer, it is our job to guide, to reassure, and to set the tone of the sessions. Most of what unfolds during the session is all due to what happened before the session. Do yourself and your clients a favor and give them the tools they need to help get the photos they want. Set the Tone. Be Silly. Keep Talking. It’s time for the session. You have a dad who does not want to be there, kids who want to act up and a mom who feels self concise and is also worried that you think her family is a circus. BREATH. It is our job as the photographer to set the tone of the shoot. 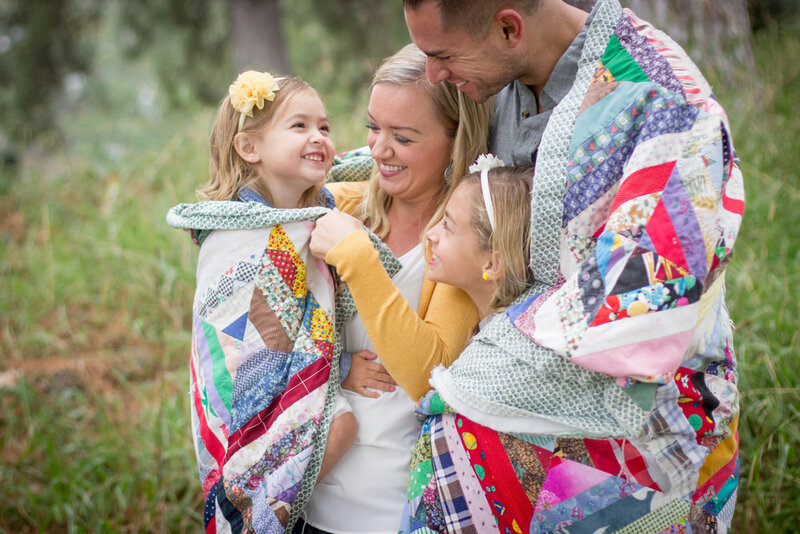 Remind the family of what to expect during their shoot. Get down on the kids level and try to connect. Be silly with them, compliment their clothes, ask them about their favorite tv show. I always reassure the dads that I will be fast and that I won’t make him do anything he is not comfortable with. I explain to the family that I don’t want them to look at me, rather at each other. They can choose to smile, or to close their eyes and soak it all in. I will give them prompts and I will guide them as needed, but most of all, I just want them to love on each other. I encourage them to ALWAYS be touching someone in the family (connection is key), and then I just bunch them up and let them go. Sometimes they laugh because they feel so awkward at first, and hey, those make great photos. But no matter what, I keep talking. I encourage and tell them how great they are doing. I crack jokes with the kids (mainly fart jokes…P.U.) lol. I let dad know that he is amazing and how great the photos are turning out. 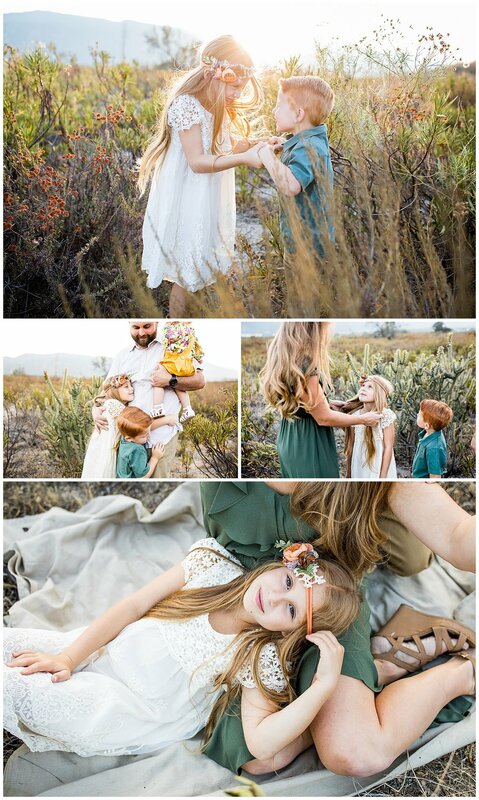 If kids act out, I reassure the parents that its normal, not to get frazzled, and just to hug and love on their kids. Just keep talking and keep snapping photos, you will be surprised at what you get. The more you do it, the more you will get comforatable with doing it. I have clients come back to me crying because they are so in love with their galleries. Many tell me that they didn’t even realize I was taking photos during that break (when everyone let down their guard). Those in-between moments are some of my absolute favorite and quickly become that photo that a mom didn’t even know she needed in her life. So, take a look at what you are advertising so you attract the right clients. Educate the clients that do want what you have to offer. And set the tone while you are shooting. I promise you will be able to draw out that emotion and start building a portfolio that makes your heart sing and is full of captivating, emotive images. The gorgeous Licata family. I’m in love with the maroons, blues and tans. Also, give me mary janes and lace dresses all day, everyday! "Where did you find that amazing color wall", people ask. This gem is located in the beautiful city of La Jolla, California (7596 Eads Ave, La Jolla, CA 92037) to be exact. As many of you know, I'm sorta addicted to color. I'm attracted to things that make my eyes LAUGH, and this is definitely one of them. Me and my sister decided to go on an early morning adventure, traveling the 120 miles from San Bernardino into San Diego county in order to experience the wonderfulness of this wall. Its randomly placed in the middle of the downtown area, next to a small Ju Jitsu shop. Parking is scarce, but hey, it's San Diego; the weathers always perfect for a short stroll. The story behind this wall is pretty cool too. You can google it, or check it out HERE. I wanted to scout this location out for Senior Sessions and Engagement Sessions. It's a drive from my normal area, but with something this fun, its soo worth it. Of course, we decided to do our own fun photo-shoot to document this awesomeness. We are silly and just goofing around, but check out the photos below if you need a little color in your life today! Want to book a session and travel down to this wall with me? Contact me HERE and lets get something on the books!! It's March, and everything is neon green here in sunny SoCal. Between the bouts of rain (which were desperately needed), we had a handful of cool sunshine-filled days. 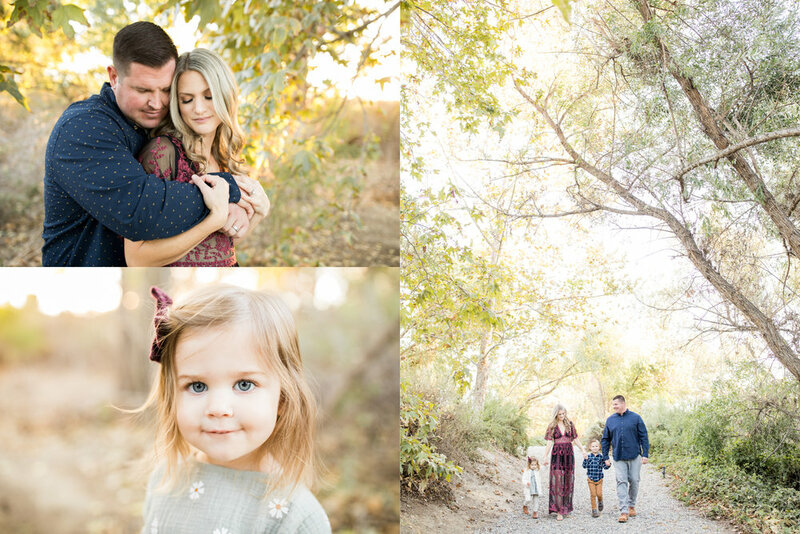 The Fisk family seemed to have brought their own blend of sunshine to their session, as every photo was just bursting with light and a brightness that encompassed their family vibes. 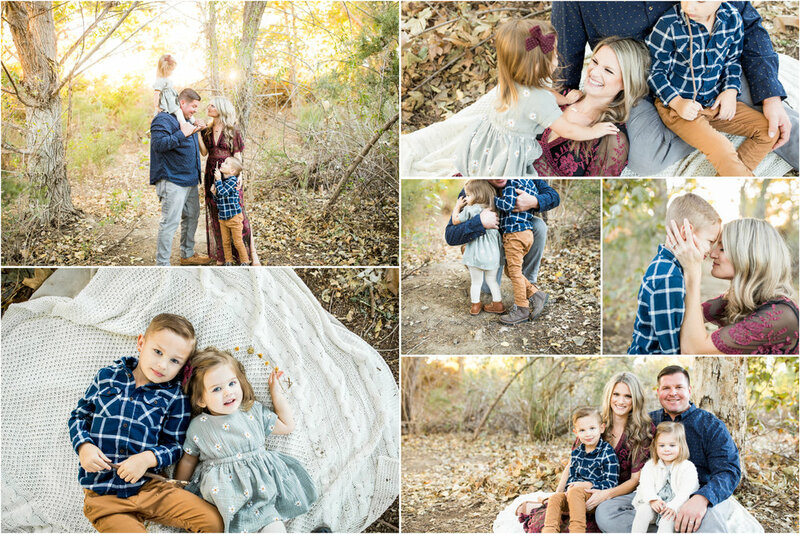 I worked along side Cherie to help her plan and coordinate her families wardrobe to make sure her family photos turned out exactly how she had it in her mind. Her two sweet kids were laughing and playing and reminded me why I adore taking photos. I not only got to play outside, but I got to connect with some amazing new people and serve them in a way that they will always remember. This blue floppy hat was that extra accessory that brought some added dimension to their photos and Cherie's outfit. It also added a little coy somethin-somethin as her and her hubby got close. I am so giggly over how sweet these two are. Looking sharp in that suit too Sir; thumbs up. Bow-tie and suspenders are always a go-to for small boys. Pair it with this cuties red hair and you have instant perfection! I know this isn't my kid, but would it be creepy if I hung this photo up in my house? haha. He looks like one of the model's that come in the picture frames you buy from the store..... Too. Cute. For. Words. The Fisk's were open to any ideas I had, and were troopers when I had them all lay down in this tall grass. I'm loving this San Dimas location because it really does give me so many options for the different photos I want to take. This face say's it all..... Big sister is all love and little brother is clearly "thrilled" with it all. haha. Thank you guys for trusting me, I'm loving the way this session turned out. Lots of variety, but most importantly, it exudes YOU. Who you are as a family is evident in all the love I see here. What a blessing. Like what you see? Want to book a session? Contact me HERE and lets get you set up for a Spring session of your very own! I remember loving to look through my moms old photo-albums when I was growing up. I loved peeling the clear protective paper off the sticky background and arranging the photos on the pages as I memorized faces. I remember thinking how beautiful my moms smile was when she was young, I looked so much like her. I remember giggling at how big my dads beard was in the early 80's, and how I loved to nuzzle into his neck (big beards oddly made a come-back in the past few years). There were albums full of baby photos of me and my sister; some perfect, some blurry with a yellow tint. Film was cool like that. It encouraged us to print our photos; ALL our photos, even the ones that wouldn't end up in frames. I got a kick out of going through the old boxes of photos that didn't make the cut, the ones that would never grace the pages of the photo albums. I remember holding up the negative strips to the light to see the bits and pieces of our everyday life and being in awe that something like that could be captured; it was magic. Like most families, the photos of our family started to dwindle after my youngest sister was born and even more as my parents headed towards a divorce. I can remember collecting photos for myself, hoarding them as if I knew things would never be the same again. Even at a young age I knew I didn't want to loose those memories. As I got older, we moved a lot. Each time we moved we lost more and more of our stuff. Either it got left behind, or put into a storage unit, never to be seen again. I remember being very protective of the boxes of photos and the old photo albums. I basically claimed them as my own; a deep need to save those fleeting memories was set so deep in my heart that I began to document everything in my life and those around me. I started writing in a diary and taking photos of everything. My plan was to put everything in a box so after I died people would be able to tell my life story...I was a weird 9 year old lol. I remember buying film in bulk and loading it into the tiny Kodak camera that I would borrow from my mom. In 5th grade, disposable cameras were all the rage and I remember getting them for my birthday and Christmas and saving up all my money to buy these cameras so I could document my life. My poor siblings were subject to special "photo-shoots" I would do. I would also practice a lot on myself before "Selfies" became a thing. I never left home without a camera in my purse. 99% of all the family photos we have now are probably ones I've taken because I just refused to be without those memories. As for professional photos, well, you either got super fancy and went to Olan Mills, or hit up the local JC Penny's or Walmart. The type of professional photos you see today were reserved only for weddings or grand events. Normal family photos didn't rank high enough on the scale to drop that kind of money. So, as time progressed, I looked for ways to do what I loved. I took photos for my 6th grade yearbook, my Junior High yearbook and ended up being an editor of my High School yearbook, all because of my love for taking photos and documenting moments. In High School I got to roll my own film in a dark closet. I loved it. I would roam the campus taking candid's and feeling important. I would then get to take that film and use the negatives to develop each and every photo that would go into our yearbook. I remember my hands smelling like solution and my eyes adjusting to the dark glow of red lights as I turned film into a tangible photo that would serve as a memory that every student would be able to look back on and remember good ol' Chino High. I got to be a part of that; I got to make something that would last long after I'm gone. It was an incredible feeling. For a few months, I aspired to be Anne Geddes and took naked baby photos of my cousin in big floral bonnets. That didn't last long, as I discovered I didn't have the patience to deal with babies (not at the age of 16 anyways). I then switched to "fashion" photography, which really just consisted of a bunch of my high-school girlfriends (and sisters) trying on clothes and hats and posing for the camera. ha-ha. Once college came, my Business Degree had my striving towards bigger goals.....corporate size goals with a large paycheck attached to them. I never once considered photography as an option for my profession. The world tells us that in order to be successful you have to do good in school, get a good corporate job so you can afford your big house and nice cars and fancy things. So, I put aside my creative aspirations and I jumped on the "American Dream" bandwagon. I spent the next 6 years going to school and doubling up my work hours between corporate temp-jobs and Starbucks. I remember in 2006 I got my first digital camera as a Valentines Day gift from my new boyfriend (current husband). I developed my last roll of film from my disposable camera and entered the world of digital photography. It was so exciting to have unlimited amounts of photo-taking opportunities and as my computer filled up with images, my tangible prints dwindled. Instead of printing my photos in albums, I just posted them to MySpace, or the fancy new invention called "Facebook" (I got one through my college, back when you could only sign up by using your school code, I'm OG like that). So I graduated school, locked in the corporate Human Resources Job, got married and had the perfect little baby..... and my passion for capturing life's little moments exploded (literally all over me lol). Like most mamas, my leap into professional photography came mostly from the desire to document my child's life. I realized just how fast the days were flying by and how much my sweet boy was changing. I knew we couldn't afford to get photos done of him every year...who am I kidding...I wanted photos every second of everyday. I looked down at my child and wanted to freeze time. I spent hours just studying his face and trying to memorize little details. I wanted to hold him so tight that I could almost absorb him into me. Do you know that feeling? Can you relate? My husband, being the very perceptive man he is, saw how much I needed to document these moments with something other than my iPhone. I confided in him about how I grew up treasuring those old photos and holding onto the few photos I had left from my early childhood. I wanted my boy to have more then enough memories to look back on. I wanted him to be able to see what he couldn't remember. That mothers day after my son turned one, my husband presented me with my very first DSLR camera, and IT WAS BEAUTIFUL. This new form of digital photography baffled me. It made me go cross-eyed. It was so much more intense then the point-and-shoot cameras I had been working with. I felt excited and scared and moved to create something worth remembering. I spent hours learning the ins-and-outs of my camera and how to shoot in manual mode. I wanted complete control over how my images turned out, so that way each and every image was intentional; something that I created out of an ordinary moment. Some days I felt defeated, most days I felt challenged and gladly accepted that challenge. I have beautiful photos of my son eating oatmeal, building legos, taking a bath, putting on his socks and smiling up at me with all the love that a child could muster for his mama. And it's worth it. I feel like that little girl, holding onto all those photos because she didn't want to forget. I'm so happy that now I'm in control of what gets captured, so I don't have to forget. I have been in business almost three years now, and I can tell you without a doubt, that photography is my calling in life. Growing up I didn't know it, but when I look back over my life, over all the moments I shared with you, it is clear what the Lord had planned for me. He put this song in my heart and I just have to sing. Because I know how important moments are, I am desperate to capture them. Life is so intricate and detailed and it moves faster than our minds are able to record it all. With each new family I photograph, I am honing in on my style and figuring out what story I want to tell....and that story is YOUR story. One of my favorite Photographers, Sarah Cornish with My Four Hens Photography, says, "I want your moments, not your poses", and that's exactly what I am after. Can I capture your moments? Can I help you document your story? Why do I do what I do? Because your moments matter. Because life is too short to not leave a legacy behind for your children to hold onto. Because more than anything, photography fills my heart to overflowing and even if only one person is impacted by my work, its worth it. These are the photos your children are going to look back on and cherish; these are the moments that will define your families long after the memories fade. This is my WHY.